Home Technology Tutorial : How to use the Slimbox 2 Image Gallery in Your Website? 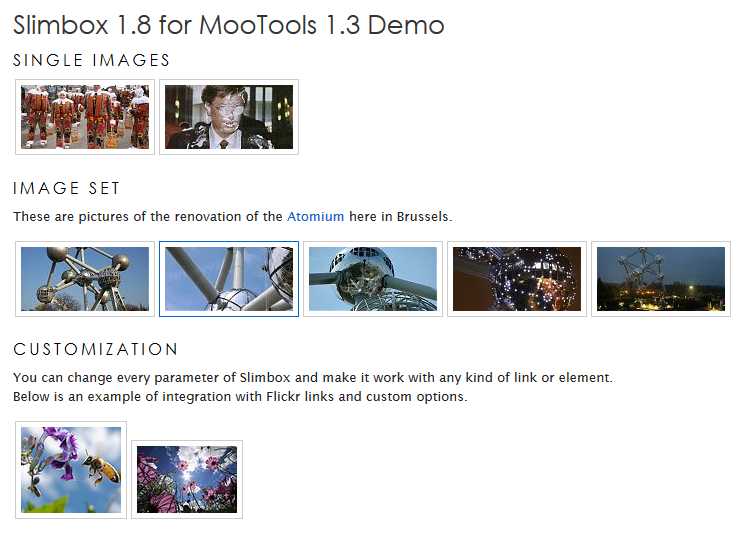 Tutorial : How to use the Slimbox 2 Image Gallery in Your Website? As we all know, Slimbox 2 is a popular clone of Lightbox a script use to display fanstastic images and other web content.Slimbox 2 was developed by Christophe Beyl and released under MIT License. One of things you will love about Slimbox 2 is the responsiveness of the jquery script, it allows you to close it immediately at any time using the keyboard or mouse and to instantly navigate to any image before the current image has loaded or the animations are complete. Another good things; the script is fully customizable, compatible to modern browsers, and it offers more options compared to Lightbox. Now let's go for the setup guide the main lesson of this post. I know some beginners will find it hard to install or make it work correctly so, I made this simple guide. *Without this doctype Slimbox 2 will not display correctly, images will go to the bottom of the page. 7. To ACTIVATE slimbox script in your image, add the rel="lightbox" attribute to the links. * In this example, I put up the word " bike" after lightbox, so the result whenever I click a single picture in a page it will open up series of images I tagged for the bike attribute.So, its now a gallery of images! *Make sure to set the Loop: bollean value to TRUE. Open the slimbox2.js and search for the keyword " LOOP". 9. Works perfectly? Oh,you can upload the attire script to your site root directory and have fun. !